The Danner Tachyon Sage Green uniform boots give your feet the protection they need without the weight. Made to be lightweight but extremely durable these sage military boots live up to the Danner name. Built with a synthetic ultralight sage green leather upper, the Danner 50132 Tachyon looks great and dry quick if they get wet. The speed lace system makes it easy to quickly get them on and off and an EVA midsole and open cell PU footbed provides shock absorption and air flow so you stay comfortable all day long. Built to last these sage green uniform boots from Danner feature durable brass hardwear and an abrasion resistant toe cap. For stability and traction, these 8 inch sage green uniform boots have a long lasting Vibram sole with a pentagonal lug pattern that provides maximum surface contact. Lightweight, quick, and durable these boots are a great choice for police and security. 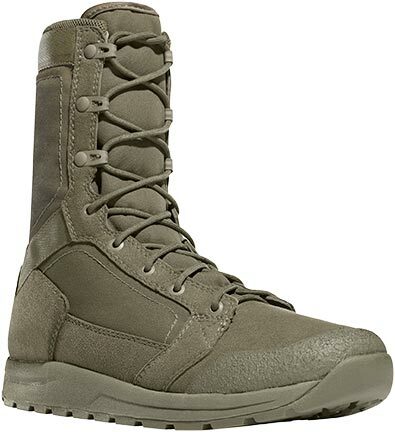 Don't get weighed down by heavy boots, order the Danner 50132 Tachyon Sage Green 8-inch military boots today!